There are a couple of new updates to the Google algorithm that have just been released, one a Panda update and the other labeled the “Webspam” update, and these latest algorithmic changes are affecting several sites that use exact match domain searches…among other things. In an effort to thwart those who try “game Google” buy buying domains names that match the exact terms that they want to rank for, Google has completed devalued and in fact penalized “exact match domain names”. Let’s take a look at an example of this. Let’s say that you realize that many people type “how to cook steak” in the search engines. One tactic to try to monopolize this term is to buy the exact match domain called “howtocooksteak.com” and then build a website that you hope will be the #1 result for that term. In the past, having an exact match term in the domain name drastically improved your chances of ranking for a term. The new Google Webspam update, which some refer to as Penguin, actually seems to count this against you and one prominent example is Viagra. 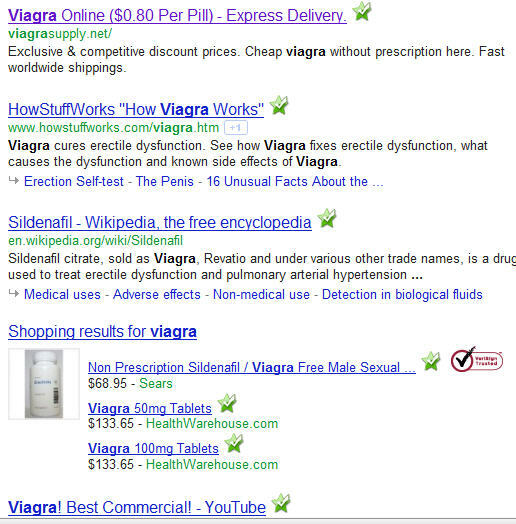 As you see in the search results graphic above, Viagra.com does not rank for the term “Viagra” anymore. I had read that this was fixed (and probably will be by the time that you read this) but whatever Google datacenter that I am hitting does not return Viagra.com in a search for Viagra on the first page of the results. It actually appears half way down the second page right now. You’re on it right now. This is my professional site and every single article is original and written by yours truly, Richard Cummings. I don’t do much SEO for this site and almost every inbound link is a natural one from someone who liked an article I wrote. Thus, a search for “Richard Cummings” would always return this site on the first page of Google, usually between locations 3 and 9. Today, I don’t exist for that search term and the only reasonable conclusion is that it is an “exact match” domain issue because my site is http://richardcummings.info. A Faulty New Google Webspam Algorithm? The Internet is abuzz about the latest Google Panda and Webspam updates. On a personal level, I find the Viagra situation kind of funny and the fact that my site is no longer returned for my name is not going to break me. Perhaps it will return after Google implements fixes. However, for many, this is a very serious issue. Take a look at some of the quotes from around the Internet today. Is this the week that the world turns back to Bing and Yahoo? I for one like their new look and my website shows in the rankings as well as it ever did, which at least brings in SOME traffic to my site since Google has disowned it. All of these stories and more can be found on this Google Webmaster forum. Should Google Do Anything Different? In a recent article entitled Google Then and Now, I discussed whether Google was losing their way or finding it. This latest change indicates to me that they are losing a bit of perspective or, at a minimum, customer appreciation. True, however, if you look at the sum of the parts–the collective web content creators who place Google AdSense on their sites, Google has earned billions off of their efforts as well. Don’t they owe some sort of explanation?